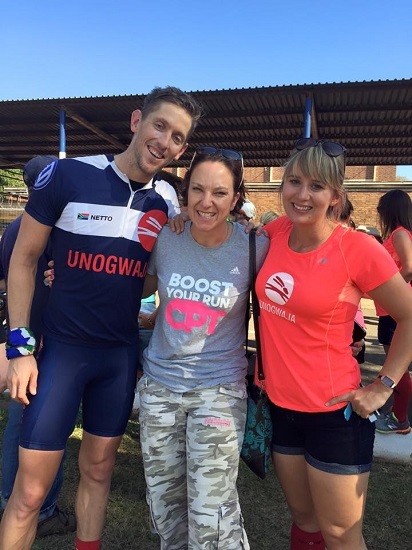 This week Unogwaja 2016 team member Amanda Cromhout became the first team member to blast through her R 50 000 fundraising goals for this years challenge. The Cape Town based mom of three has no plans to stop there and is doing her best to help make a sustainable difference for the future of our country. Having chatted already to captain Nat and father figure the Stoff, Amanda was an obvious next person to chat to about all things Unogwaja. Jabu: How did you find out about the Unogwaja Challenge? Amanda: I heard about it when Miguel Netto (Migs) was chosen as reserve for 2014. I work with Ros (Migs now wife!) so heard all about it and was behind his experience. I also knew Josh, the captain of the Unogwaja team in 2014. That year I ran my 1st Comrades and I remember going with friends Nicky and Charlene to meet their friend Josh coming in to Comrades House. It completely blew my pip that these folks had just cycled from CT as we had all protected ourselves meticulously for the build up to Comrades. Jabu: So knowing about Unogwaja is one thing, but what made you want to join the Unogwaja Challenge? Amanda: I was so emotional in 2014, seeing Josh arrive in Pietermaritzberg (I didn’t even know him well). I said to myself then “maybe someday, I can be part of something like this with such purpose”. Then in 2015, when Migs got selected, I found myself totally intrigued and glued to his progress. I followed the team daily and was an emotional wreck when he and Ros (Support Crew 2015) arrived to walk up Maritzberg High St. last year. I knew then that I wanted to be part of something so incredible and also to satisfy an insatiable adventurous streak! I remember saying to Theo, my husband, that I would like to do this one day. When applications opened in August, I just thought, ‘sod it!….today’s the day! A bit like that poem from cat in the hat! 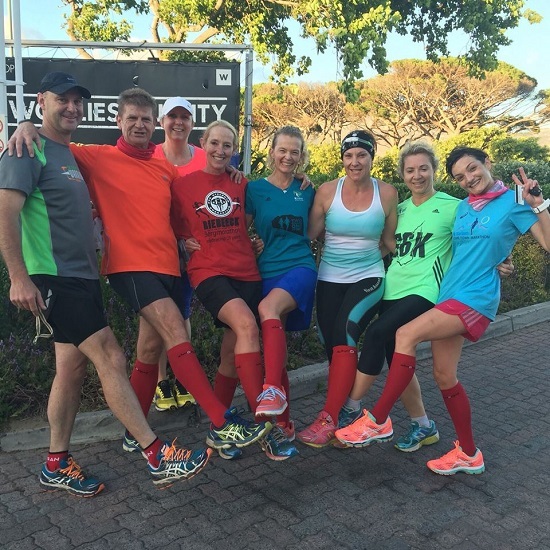 Jabu: Unogwaja is a journey of heart, but it’s also one heck of a physical challenge. Tell us about your endurance sporting experience in the past? 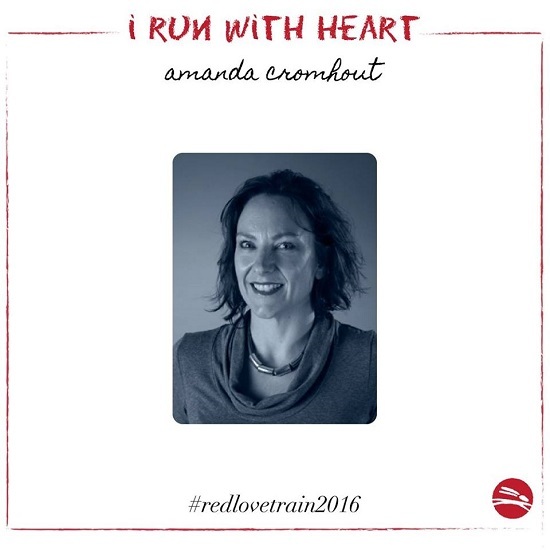 Amanda: I never in a million years would have thought of myself as an endurance athlete! It amuses me somewhat! I have done Comrades twice (back to back 2014/5) and a couple of triathlons, DC, etc. I must admit cycling is far from my forte so it will be a massive challenge. I love my running and have to focus on cycling. I guess 10 days of it will get me focused! Jabu: I promise you it will! If you could leave the kids of Umsilinga Primary School with one message of hope, what would it be? Amanda: That there’s a leader, a champion and a master of one’s own life – within each and every one of us. They have the world at their feet, and hopefully seeing that others through the Unogwaja Trust are believing enough in them, their environment and their school that this opportunity is afforded to each and every one of them. I have 3 kids and just listening to their outlook on life fills me with excitement and courage everyday. Kids simplify everything for themselves and if we could live our lives through their lenses, with no barriers, we would all be happier. Jabu: Why is it so important for you to make a difference rather than sitting back and watching others do it? Amanda: I’ve never really been a sit back kind of person. My mates in the UK all take the piss out of me that I never sit still and am always doing stuff. My parents taught me that money doesn’t grow on trees (nothing privileged in UK terms about my Stoke on Trent upbringing). I understand that luck comes to those who work damn hard. I think in my teens and 20’s the hard work was all about what can I achieve for myself. By the time you reach 30…it a bit more about a holistic life. Now I’m in my forties, its super important to be making a positive impact with everything,whether that’s at work, home (creating the best possible home life and aspirations for our kids) or now Unogwaja. I’ve been involved in many different charities/trusts for many years so my interest in Unogwaja was an easy and super important step. Jabu: I really dig your vibe around that and its such great words that show you have had so much inspiration in life. Who are the people in your life that have inspired you to change the world? 1 of my earliest leaders in business, David Noyes, when I was faced with a career dilemma, encouraged me to take the really super scary role (as British Airways GM South Africa as a scared 29-year-old British lass). He said “if it doesn’t scare you, it’s not worth doing” and this has stuck with me as a life motto. It also connected me for the 1st time & then the rest of my life to South Africa. My kids: it’s the biggest privilege to be able to show your kids that it’s worth working hard to change the world – who wouldn’t want to do that!? Jabu: You have been doing an outstanding fundraising job, do you have any fundraising events coming up and where can our readers find out about it? Amanda: This past weekend we held one in Ealing, London with about 40 friends, including Stoff & Martin/Steve from Unogwaja 2015. Mid-April there will be a Cape Town based event. Dates and location still to be confirmed. I will be doing it with Ros and Migs. We will get ourselves organised with website/Facebook etc but any one of us will be publicising the event so Facebook: Amanda Cromhout; Miguel Netto; Ros Netto. I’m also selling running tee shirts with the slogan: “Don’t be tired; BE AWESOME!”. 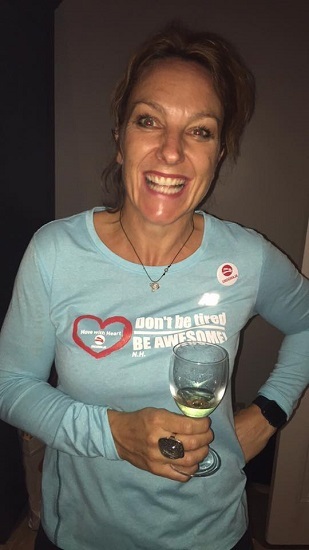 It comes from Nicky, our running friend, who screamed this at 41km to our mate Derek, when he timidly stated he was tired at the end of his Comrades qualifier! They are super cool shirts – also available via Facebook or from me directly. Jabu: Although it already seems apparent to me in talking to you, what do you hope your legacy on the world will be? Amanda: I am a mother and wife first and my family feels loved at all times. They are silently proud of me. I have pushed every boundary, whether that is at work, physically or through significantly ‘changing the world’ with programmes such as, Unogwaja. Over and above all of this, I live with a sense of daily gratitude and laugh out loud every day! Jabu: Where can our readers interact with you online? Would love to interact with anyone willing to engage!